I was waiting at the bus stop and saw these fingerless gloves on the ground. Someone have dropped them. this happened some time ago, and i was reminded of them when i made a comment on somone’s blog who said it was cold in their flat, and in the course of the chitchat to and fro, she said she works from home and use the computer a lot and cannot type if it is too cold. that was when i suggested she use fingerless gloves. I picked them up, because I tend to collect gloves that people drop on the ground. i know, funny hobby. They are very useful. Usually I find only one pair, but this time, they were a matched pair. And it was only afterwards when I had a good look at them did I find they have an unusual cap to cover the fingers and which can be buttoned down when not in use. The thumbs are covered which i think is a really good thing. 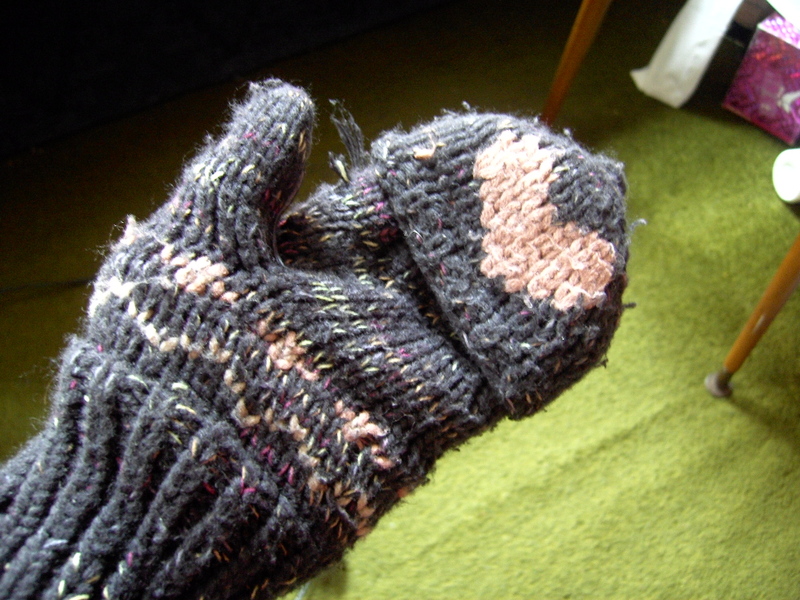 most fingerless gloves uncover the thumb as well. They were very well knitted though they have been well worn, because some of the threads were coming loose. 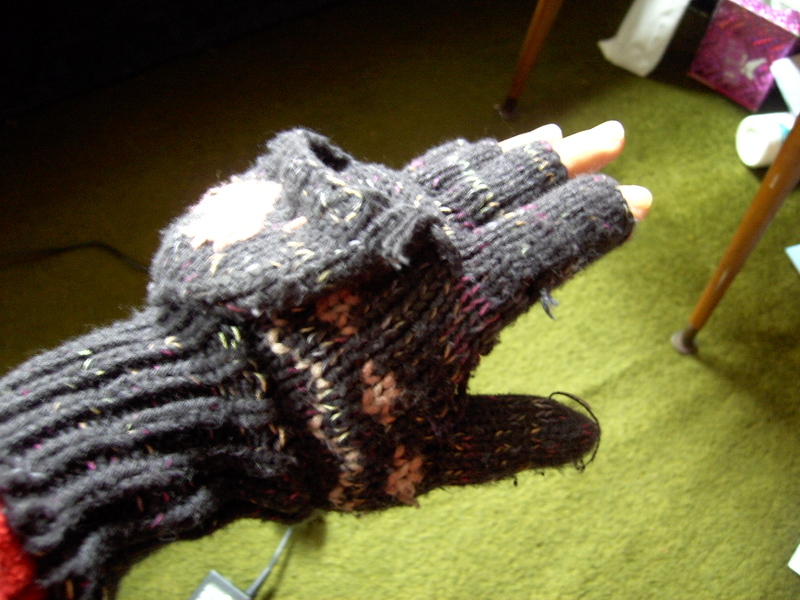 Fingerless gloves are excellent to keep the hands warm whilst typing. And these have the caps to cover the fingers when not typing. They are called capped mittens i think. You don’t see these kinds of gloves much nowadays. I googled it and found amazon were selling them at £13 a pair. Made of alpaca wool , I don’t know what these I found are made of but it might well be alpaca wool. There was no information inside the gloves. I practise this, and have not had the heating on for 4winters now. i am so used to it, that i dont notice the cold anymore when i am in the flat. i dont even bother to buy a thermometer to find out what the temperature is in my flat. but a year ago, friends have given me a nhs thermometer, a very simple one on a leaflet that shows the temperature using some mechanism that is not mercury. and i found out that even in the coldest night, the lowest it has gone is 12C. though since the thermometer is graded only to register 9C, and nothing below, i guess i wont know if it does go below 9C. haha. We have been so brainwashed to believe that we will die if we dont have the house heated up. 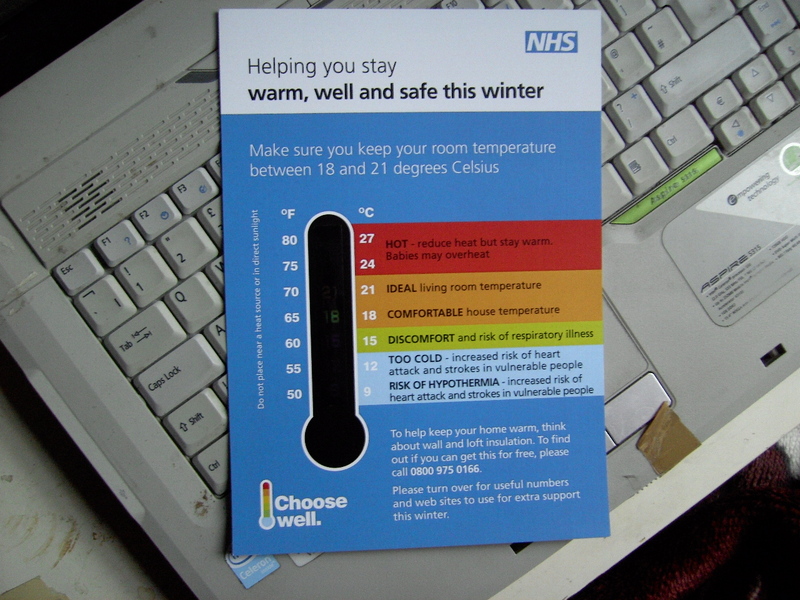 As u can see in the leaflet , it warns that 12C is ‘too cold, increased risk of heart attack and strokes in vulnerable people’. It conveniently do not mention who are at risk. i think very few. but that warning will frighten everyone who are not strong minded enough to test it for themselves. The danger of these blanket warnings, is that it caters to the lowest denomination and for simplicity’s sake do not list who they are. now i know that you wont die from low temperatures if u are kept warm with appropriate clothing. as long as there is no wind u can survive even if the temperature is at 0C. the cold wind chill is a big factor in how cold u feel. anyway below is the link to someone who also practises the same thing as me and who asked this question in the guardian . This year I’ve gone without heating apart from the rare use of a wood-burning stove. I’ve managed well, but friends and family take a dim view of my low indoor temperatures. Meanwhile I find their homes intolerably overheated. Can you back up my assertion that my way is the ethical way?